I had the honor of coordinating Ariana and Chavo’s stunning wedding earlier this July in Eugene, Oregon. They had a beautiful Catholic ceremony at Saint Mary’s Catholic Church, and guests joined the couple for cocktail hour and a reception at the Downtown Athletic Club. Ariana’s friends did her and her bridesmaids hair and makeup. 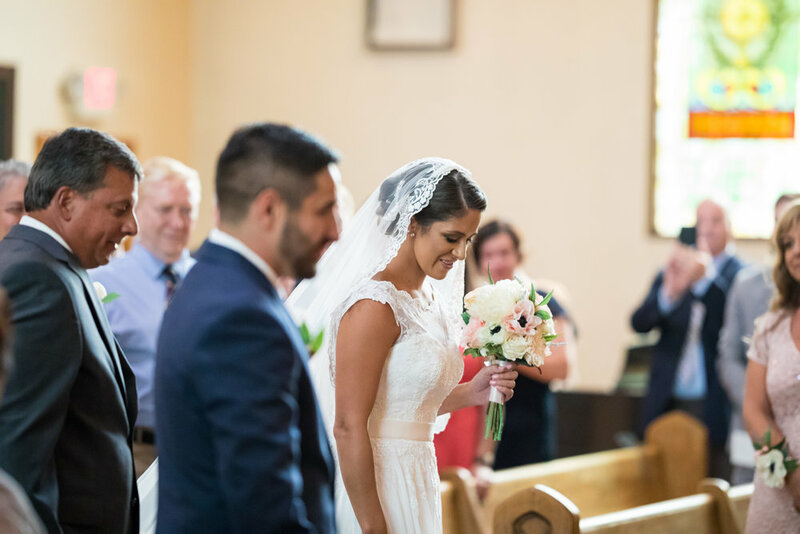 Ariana rented silk bouquets and boutonnieres from Something Borrow Blooms, a boutique that mails you the arrangements you request for your wedding day, which you just mail back once you’re done with them! You could hardly tell in photos that they’re not real. The Groomsmen rented Generation Tux for their suits. We had Joshua Rainey Photography take the wedding photos! The Downtown Athletic Club (DAC) catered and provided all of the rentals and centerpieces, as well as helped me with set up and tear down. They were incredibly helpful the day of, and offered use of their room of various decor pieces. Ariana’s cousin’s provided the photobooth! Ariana and all the single ladies enjoyed a traditional bouquet toss, but for the garter toss, because Ariana didn’t want to be involved, Chavo tossed her garter on a small soccer ball instead! One of the surprises I was in on was having Puddles The Duck surprise the guests during the reception. Ariana and Chavo both graduated from University of Oregon in Eugene, so this was special for them and their families. Puddles was also a riot! The Reception DJ was Trevino Entertainment, who got the dance party going until almost midnight!